How do I Turn my Laptop PC into a Desktop PC? If you’d like the larger screen and keyboard of a desktop PC, but the mobility of a laptop PC, you can do both. Here’s how to turn your laptop PC into a desktop PC. Pick up a USB mouse and keyboard, or for the ultimate in cord-cutting, a Bluetooth mouse and keyboard. You’ll need batteries if you go the Bluetooth route, and be sure your laptop supports this feature. Pick up an external monitor and cable. Most laptops can output in VGA. Laptops made in the last three years or so can do HDMI too, which is even better, because HDMI does sound too, so you can plug speakers or headphones directly into the monitor! Plug in the keyboard and mouse, or pair them in Control Panel in the Bluetooth settings. 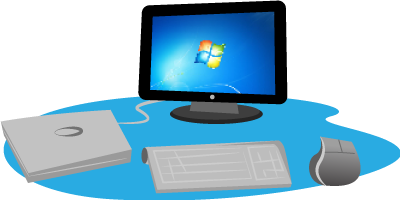 Plug in the monitor, and configure a second screen, also using Control Panel (click on Display). Click on Power Options in Control Panel, click Change Plan Settings, then Advanced Plan Settings. Click Power Buttons and Lid, then Lid Close Action. Change both choices to Do Nothing, then click OK.
Now, close your laptop’s lid and put the monitor just behind it. Viola! You’ve got a desktop PC. When you need to take your laptop with you, simply disconnect the monitor. Make sure the laptop’s in Sleep or Standby mode for transportation, so you don’t drain the batteries in your Bluetooth devices.